The Republic of Fritz Hansen™ presented two pieces of furniture in the Salone Internazionale del mobile 2014: Analog™ - the new table of the world famous Spanish designer Jaime Hayon and a re-edition of the popular chair Drop by Arne Jacobsen- Both designs invite us to notice and value the people surrounding us. The products are available from Autumn of 2014 in shops and they can already be ordered in the shop. After more than 50 years of hibernation, Fritz Hansen presents the Drop chair. 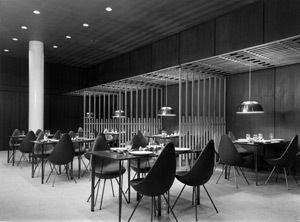 This chair was designed by Arne Jacobsen for his masterpiece, the famous SAS Royal Hotel in Copenhagen in 1958. 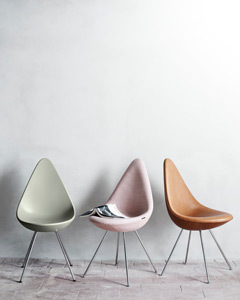 The Drop was initially produced together with the Egg chair and with Swan. In a very limited edition and exceptionally for the hotel, which is the reason why it became a collector’s piece. Thanks to new production methods, the Drop is available made of contemporary materials, suitable for modern homes as well as equipped with fabrics or leather, always remaining true to the original. Drop is a sensitive chair with a lot of character. This chair is fresh and vivid as if it was a new designed one and it still keeps his own story. That’s why it has an unmistakable personality, which is noticeably bigger than its simplicity might make you think on the first sight. The love for details and the unique design make up a brave statement, which offers even more modernity to the chair so that it suits in today’s life as well as in life before 50 years. The backrest unifies the feeling of a warm hug with big movement liberty, which leads to surprising comfort. The chair elegantly fits in a lot of different surroundings and it therefore is an exceptional example for furniture design, which influences and upgrades the rooms it is in, by means of simply being there and being beautiful. ”Confronted with a synthetic material, which hasn’t got any structure nor any shape, Jacobsen was inspired by the outlines and contours of the human body when he designed his chair. That’s how he made the technique a human one. The chair Drop for the Royal Hotel represents a masterly cut between art and industry”, is what Michael Sheridan, architect, writer and Arne-Jacobsen knower thinks. Together with the re-edition of Drop, Fritz Hansen presents another highlight which will be on the market from Autumn of 2014: the Analog table. 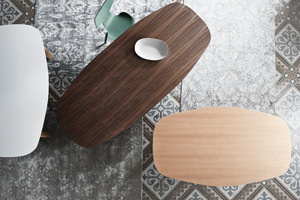 Jaime Hayon designed Analog for the Republic of Fritz Hansen. This table tributes the unaltered togetherness of people at one table and it brings us closer to each other. Today’s world is embossed by the communication through digital devices. Analog offers a place without the need of any digital devices. The table encourages the way back to real togetherness, which contrasts out digital life with the demand of continuous online activities. Analog invites us to engagement, exchange, intimacy and presence – in other words, to an offline existence. Analog isn’t angular, round or oval – it has a new form, which unifies the best things of the three mentioned classic types in a new one, an organic form. Here there is no hierarchy, but only a beautiful platform for conversations that wonderfully suit the modern relationship between family members, friends and colleagues. ”The table is an underestimated piece of furniture. In my opinion the table is the heart of the home, the office, the restaurant. We communicate our greatest happiness moments and pains with each other at the table and we finally experience some of the most important things of our lives there. What makes Analog unique is its shape. It isn’t square, nor round or oval, but something in-between, encouraging dialogues and intimacy. I intensely worked at the shape of the table in order to make it act heavy and weightless at a time, to make it express quality and equip it with the unmistakable DNA of Fritz Hansen”, explained the designer Jaime Hayon.